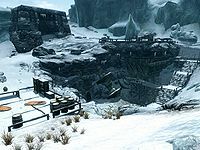 Saarthal was the first city built in Skyrim after the arrival of Nords from Atmora sometime in the middle of the Merethic Era. Saarthal was also the first capital of Nord civilization in Tamriel, as well as the largest of the ancient Nordic cities. The city was destroyed late in the Merethic Era by the Snow Elves, and then rebuilt by Ysgramor after he retook the city. It was destroyed and finally abandoned sometime in the late Merethic or early First Era. In the late Second Era, the ruins of the city were located by archaeologists near the modern city of Winterhold. After Trinimac and his followers were corrupted into Malacath and the Orcs, they fled to the northern wastes near Saarthal. During the city's construction, the Nords unearthed the Eye of Magnus, which they attempted to keep secret by burying it under the city. The Snow Elves learned of the powerful artifact, however, and wanted it for themselves. They attacked the city in order to secure this power, an event known as the Night of Tears. Everyone except for Ysgramor and his two sons, Yngol and Ylgar, were killed and the city was burned to the ground. Ysgramor fled back to Atmora to gather an army with which to fight the Elves. Before the Snow Elves could find their prize, Ysgramor and his Five Hundred Companions returned, strengthened by powerful enchanted weapons and armor created by Ahzidal, drove the Elves back from Saarthal, and began a campaign to drive them from Skyrim entirely. Although the city was lost, the Eye remained buried under Saarthal until the College of Winterhold unearthed it in the Fourth Era. The local Nords, however, did not approve of the college mages digging among the dead of the ruined city. Jyrik Gauldurson, one of the three sons of Archmage Gauldur, fled to Saarthal after his treachery in seizing the Archmage's powerful amulet. He fought and killed ten of Archmage Geirmund's battlemages before finally succumbing, and was sealed within the ruins. One of Ysgramor's Five Hundred Companions, the legendary warrior Reynir, claimed to have survived the Night of Tears and sailed back to Atmora with Ylgar. The fall of Saarthal is thought to be responsible for the creation of Sheor, a demonized version of the Nordic god Shor. This page was last modified on 16 February 2019, at 09:20.